BrainyEX – a new solution for an old problem! Many things can affect our cognitive function, including age, health, stress level, and more. By making better choices for body and brain health, you can ensure a better future for yourself and your loved ones. 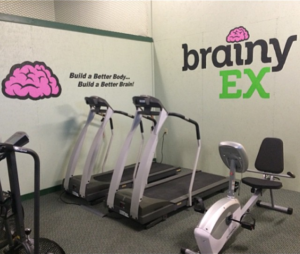 The BrainyEX program provides prescribed exercise, education and tools that result in better physical fitness and brain function. You’ll notice improvements in memory, attention, concentration, analysis, and emotional state. BrainyEX is also designed toimprove your overall health, including cardiovascular fitness, weight, and diabetes management. BrainyEX is based on the latest research, proving that prescribed exercise and key lifestyle changes can make a big difference in brain function! What Can BrainyEX Do For You? You have the power to improve your brain function, health, and memory today! Our Brainy EX program is an 8 week program that meets once per week. You begin by having an in depth pre-program testing of your physical and brain fitness. Each week we will have exercise and brain activities along with a different discussion topic. At the end of the 8 weeks we do a re-test to assess your progress. Contact our Health Club for more information. BrainyEX from BrainyEX Coach on Vimeo.